The Nakajima Ki-84 Hayate (キ84 疾風”Gale”) was a single-seat fighter flown by the Imperial Japanese Army Air Service in the last two years of World War II. 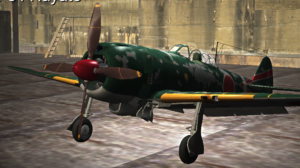 The Allied reporting name was “Frank“; the Japanese Army designation was Army Type 4 Fighter (四式戦闘機 yon-shiki-sentō-ki). 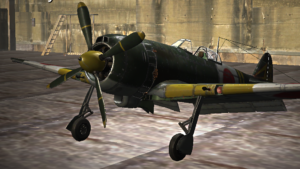 The Ki-84 is generally considered the best Japanese fighter to see large-scale operation during the conflict. The aircraft boasted high speeds and excellent maneuverability with an armament (up to two 30 mm and two 20 mm cannon) that gave it formidable firepower. The Ki-84’s performance matched that of any single-engine Allied fighter it faced, while its operational ceiling enabled it to intercept high-flying B-29 Superfortress bombers. Pilots and crews in the field learned to take care with the plane’s high-maintenance Nakajima Homare engine and landing gear prone to buckling. The difficulties of Japan’s situation late in the war took a toll on the aircraft’s overall field performance as manufacturing defects multiplied, quality fuel proved difficult to procure, and experienced pilots grew scarce. 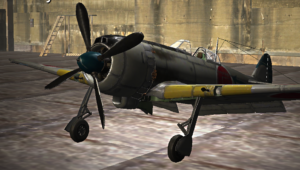 Even then, the pilot of a well-maintained Ki-84 took to the skies in knowing possession of Japan’s fastest fighter. A total of 3,514 aircraft were built.